Though Walla Walla may not have Napa Valley's cachet, it's drawing some of the biggest names in the wine business. Former B. R. Guest restaurant group wine director Greg Harrington will soon start producing wines here, and winemaker Christian LeSommer, formerly of Château Latour, will consult on Bordeaux-style wines at a new venture, Château Rollat. And at his Long Shadows project, ex-Ste. Michelle Wine Estates head Allen Shoup works with different star winemakerssuch as globe-trotting consultant Michel Rollandfor each wine. Long Shadows' 2002 Chester-Kidder is a blend of Merlot, Cabernet Sauvignon, Syrah and Cabernet Franc. Chile's Macul family has grown Sauvignon Gris, a quirky pink-skinned relative of Sauvignon Blanc, since it brought vines over from France in the 1800sbut it has rarely if ever exported the wine to the United States. 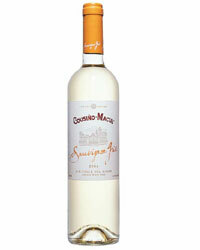 Now the 2004 Cousiño-Macul Sauvignon Gris ($12) is available here. It's delicious, softer than Blanc but with a zesty grapefruit edge.